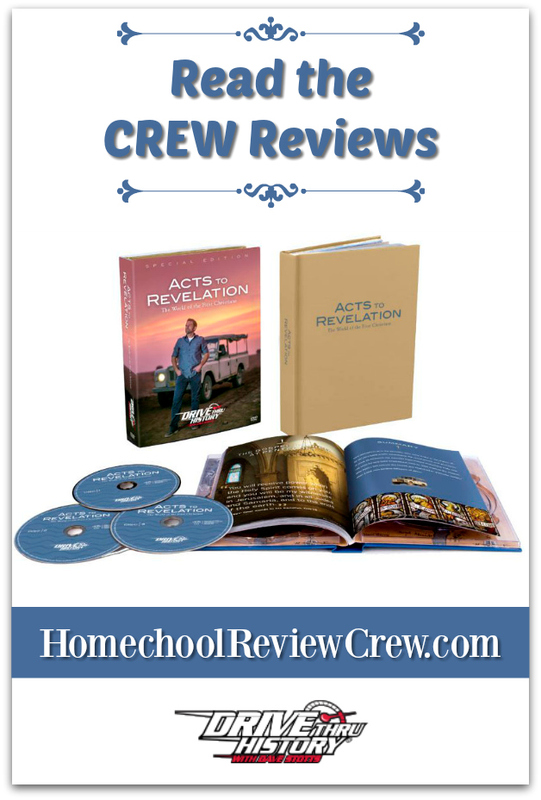 My husband and I really enjoy watching the videos from Drive Thru History®, so we were thrilled to receive Drive Thru History® “Acts to Revelation” to review. My family received a three DVD set. Also included in the package is a study guide, to help viewers dive into the life of the world’s first Christians. Here are two of the discs, and the cover of the study guide. The third disc is on the back. The episodes are each 30 minutes long. There are eighteen episodes, covering the life of early Christians. The first one is set at the Day of Pentecost, and the episodes systematically cover the events in the New Testament. Dave Stotts makes an incredible guide throughout this series. He’s back in his Land Rover from Drive Thru History® “The Gospels.” Some of the younger kids remembered that he’d cooked meat on his engine in that series, and were excited to see that it was back again! Instead of watching the series straight through this time around, we opted to really dive into the study guide. It means we’re taking longer to watch the episodes, but we really getting a lot out of these! Typically, we watch the episodes at night after the younger kids have gone to bed. Sometimes we watch on the weekend so they’re watching too. I appreciate that this is a family friendly series, so I don’t feel like it can’t be on when the younger crew is watching. After watching an episode, we’d pull out the corresponding lesson in the study guide. What Was It Like to Use the Study Guide? We used these questions as trivia of sorts, like a “were you paying attention to the video?” guide. Then, it was time for the scripture reading. For each video, there is a list of corresponding scripture to read. Well, there was the reference at least. So you look at what was recommend and then pulled out the Bible to read. I love how this got us studying the scriptures! We’re moving through at a pace of one episode a week, so we still have a ways to go before we hit Revelation, but it’s been so nice to read and then compare the episode to the Biblical account. Finally, the study guide contains a “Side Road” section. This has some neat nuggets. You’ll find some amazing pictures of artwork and photographs depicting some of the places and people mentioned in the series. I appreciate that this DVD series is high quality. It’s something I can watch with my husband and our oldest daughter, and truly enjoy. The video, the sound, the images, everything is well done. The host, Dave Stotts, is great. He’s funny when it’s appropriate, serious when it’s time to be serious, and always full of so much information. I learned a ton about the life of the early Christians through this series so far. My favorite part though? The way they encourage you to study the scriptures on your own. You should never take one person’s account of what happened during Biblical times as solid truth, without taking time to see what the Bible says. The only way you can know what the Bible says is to read it. So videos that point us back to the scriptures are good! And the episodes are so packed with information.They are recorded in the Middle East, right in the places mentioned throughout the scriptures. I enjoyed being able to see these important places. There’s a nice sprinkling of current events, as this series was recently recorded. Dave takes time to reference current events and how the land has changed over the years. For instance, he couldn’t go to the biblical town of Antioch, because it’s now in Syria. With the current war raging, it wouldn’t be safe to film there. So, they just referenced it instead of going there. It was really eye-opening to see. In case you couldn’t tell, my family really enjoys these DVDs! In fact, my husband often rewatches them on his iPad at night. (We transfer all DVDs to iTunes so they don’t get scratched!). If you’re looking for a multi-media approach to Bible study, or just want to learn more about the events of the New Testament, I highly recommend this product! I was one of eighty reviewers for this product. To see what the other homeschooling families thought, please click on the banner below.